Now that Francis Bacon (1909-1992) has been dead for over a decade, and we can begin to form some sort of perspective on the twentieth century, the scale and significance of his achievement are becoming increasingly apparent. With the exception of Picasso and Andy Warhol, both of whom have museums dedicated to their life and work, we probably know more about Bacon than any other modern artist. This is ironic given how extensively Bacon edited his artistic past. But the gift, in 1998, of his London studio and its contents to the city of Dublin and its faithful reconstruction in the Hugh Lane Gallery, have transformed Bacon studies. Some 7,500 items were discovered in the studio, where the artist lived and worked for over thirty years, and the gallery has catalogued and entered every single one onto a special database. These entries give a unique insight into Bacon’s eclectic sources, preoccupations and working methods. 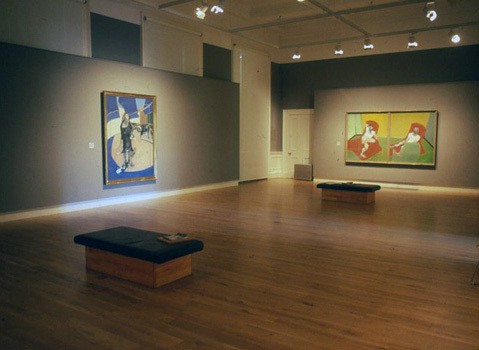 A handful of exhibitions has been staged in the last three or four years exemplifying this new, analytical approach to Bacon’s art, culminating in the magisterial Francis Bacon and the Tradition of Art (Vienna and Basel, 2003-4).This examined the full range of Bacon’s work in the context of those artists from European high culture whom he appropriated and assimilated Michelangelo, Velázquez, Rembrandt, Ingres, Degas, Van Gogh, Picasso as well as the motifs and subjects that obsessed him: papal imagery; curtains and veils; the open mouth; the cage; circular forms, spaces and structures; the male human body; portraiture; mirrors and reflections; the shadow; the Crucifixion; meat and flesh. More recently, Martin Harrison in his book In Camera (2006) has revealed the extent to which Bacon based many of his most memorable images on ‘low art’ sources such as photographs and film stills torn from books, magazines and newspapers. In his interviews with David Sylvester from the early 1960s onwards, Bacon readily admitted his debt to the great art of the past, which he knew only in reproduction, and often referred to his use of Eadweard Muybridge’s sequential photographs of human figures and animals in action. But Harrison draws attention to a stratum of less elevated imagery which fascinated Bacon and which his friend the painter and photographer Peter Rose Pulham called ‘bad Press photographs reproduced through a coarse screen on bad paper.’ Harrison also convincingly points to an obscure German book on spiritualism, with trick photographs of ectoplasms, emanations and other psychic phenomena, as an important source which the artist did not acknowledge; a paint spattered and well thumbed copy was found in Bacon’s studio. Bacon liked the news photograph because it was instantaneous and to a large degree reliant on chance. In its fluidity and suppression of detail, it suggested transmutation and flux qualities he tried to capture in his own radical manipulation of paint. David Sylvester, in a lecture on the artist (given in 2001 but not published until this year), argues that the main reason Bacon worked from the photographic image rather than from life was that ‘it is easier to make a flat image … based on the observation of an existing flat image than it is to make a flat image based on the observation of something in the round’. In other words, Bacon, who lacked the traditional art school training of painting or drawing from a living model, found that photographs had already done some of the work of translating three dimensional form into two dimensional form for him. Bacon painted a small number of portraits from life in the 1950s but from the early 1960s preferred to work from commissioned photographs of friends and lovers which functioned as a kind of aide-mémoire while he tried to imagine their presence on canvas. Their actual presence in the studio, he claimed, would have inhibited his freedom to ‘distort’. Until recently, Sylvester’s series of conversations with the artist, first published in 1975 and twice expanded in the 1980s, was one of the most quoted texts on any twentieth century artist. Interviews with Francis Bacon helped make Bacon a public figure, or at least a very public kind of artist, in his lifetime. Shortly before his death in 2001, Sylvester published Looking Back at Francis Bacon (2000), a collection of essays, thoughts and new biographical material to which he added previously unpublished extracts from his recorded interviews with the artist. In one section, ‘Bacon’s Secret Vice’, Sylvester was forced to correct the impression, which Bacon himself had been careful to promote in their conversations, that the artist never made preliminary studies before starting a painting; over seventy rapid, perfunctory sketches were found in Bacon’s studio before it was transported to Dublin. Bacon also made lists of ideas for paintings on scraps of paper and on the inside covers of books. But both categories should be seen as substitutes for fully worked out compositional studies in the same way that photographs were including photographic reproductions of his own work, which Bacon increasingly ‘quoted’ as he got older. So, in spite of such minor ‘economies with the truth’, Interviews with Francis Bacon (1987) will remain an essential resource for many years to come, especially when read in conjunction with Sylvester’s final revisions and reflections on this most profound and complex of painters.